Trust us when we say Jumping® Fitness is one workout jam-packed with energy, colours, vibrancy, fun and creativity. High in intensity, yet low in impact and easy on the joints, it is suitable for everyone regardless of age and fitness level. 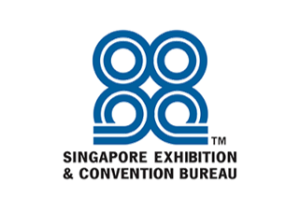 Jump with us at actiFIT Asia 2019 on 22-24 March! There will be multiple sessions for you to choose from. Bring along your family and friends, and jump as many times as you like! The team from Jumping Singapore are passion personified who will guarantee you a weekend of splendid fun while working out to better health! As a Social Enterprise, Jumping Singapore’s mission is to support poor and homeless Singaporeans. So, when you jump with them you are contributing towards this noble cause too! On Registration Page, select EXPO ONLY Pass and move to the next page to add the “Jumping Fitness” sessions you wish to attend. Slots are on first-come-first-served basis. Catch their energy live at actiFIT Asia 2019! A veteran Jumping® Fitness instructor who focuses on imparting correct jumping techniques for effective results. 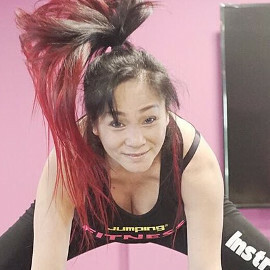 Well-loved for her structured delivery and warm personality, Li Leng conducts jumping fitness classes up to 7 times a week. A senior Jumping® Fitness Instructor and a well-loved personality in the entertainment and fitness arena. She has been actively involved in leading, training and creating Jumping Fitness choreographies for events and presentations. Among the first batch of certified jumping instructors in Singapore, she has about 3 years of work experience in conducting classes, performing & leading in major events for corporate clients, government institutions, private and community clubs. 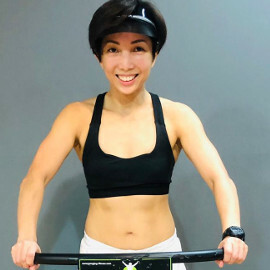 An experienced & inspiring jumping fitness instructor and a medical specialist doctor professionally known as Dr Chia Yin Nin. She recommends jumping fitness as a holistic component of a preventive lifestyle. Loved by many for her energetic, high-powered classes. An innovative jumping fitness instructor who incorporates the best combination of jumping techniques to help clients achieve optimal results. A pioneer in jumping TABATA, clients love her well-structured, dynamic classes & her spirited personality. A dynamic jumping fitness instructor well known for her high intensity classes & precise technical execution. A strict teacher with sense of humour, she encourages jumpers to work towards their health & fitness goals through consistency & discipline. The feminine touch of the outstanding Jumping Fitness team, Jumping JIM, known for their synergistic energies & creative choreographies. Passionate and zesty, Melissa’s irresistible smiles & contagious energy motivates jumpers to achieve better fitness outcomes.